USCG and FM approved for Class B fires in both industrial and marine applications, Manual/Automatic Fire Extinguishing systems are pre-engineered and self-contained. They use non-corrosive clean agents that virtually eliminate collateral damage, while quickly extinguishing flames (in less than 10 seconds). 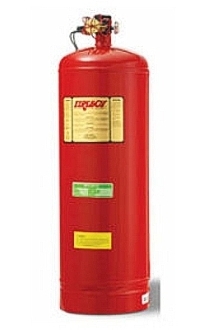 Ideal for protecting enclosed areas up to 1300 cubic feet that house flammable liquids. Use HFC-227 in normally unoccupied areas and most all marine applications. Note: HFC-227 should not be installed where building code requires smoke and fire detection and/or panel controlled release of agent.